Our product range includes a wide range of turmeric finger. Turmeric Finger is a perennial herbaceous plant belonging to the Zingiberaceae or the ginger family. The tuberous rhizomes or underground stems have been used since ancient times as a condiment, atextile dye, and as medicine. 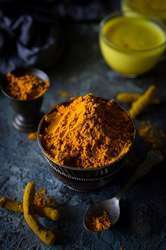 Turmeric Finger is used most in the powder form. It is bright yellow in colour, has an earthy, acrid aroma and a pungent, slightly bitter flavor. Turmeric contains an essential oil with a variety of sesquiterpenes. The colour and the taste come from conjugated diarylheptanoids. It is an excellent source of dietary fiber, vitamin B6, iron, potassium and manganese. It is also a good source of vitamin C and magnesium. Turmeric is very low in cholesterol and sodium. Indian turmeric is considered the best in the world and India produces nearly 90 percent of the world's turmeric. Experts at Grover have intimate knowledge of the products they bring you. Right from cultivation to processing to packaging, we know what it takes to bring you the quality you expect. At Grover, turmeric is carefully handled right from the time it is unearthed so that it retains its color, aroma and beneficial properties. The rhizomes and smaller fingers of turmeric are boiled separately for 40 minutes. These are then drained and dried in the sun for 10 to 15 days, until they become dry and hard. The dry turmeric is cleaned and polished mechanically under close supervision, in a carefully controlled environment, under conditions certified by Grover. Utmost hygiene is maintained right from harvesting to packing. Leading exporter and supplier of Turmeric Finger. Grover Sons also supply steam sterilised turmeric powder.